Domestic Cat Behavior Patterns: Why Do Cats Do That? Domestic cat behavior patterns often seem mysterious, and we sometimes scratch our heads about why cats do what they do. Feline behavior, however, as a whole is very similar whether the animal be wild or domestic. It's helpful to understand, then, how your cat adapts these behaviors rooted in the wild, to living a domesticated life under your roof. So, the next time you're puzzled by what your cat is doing and why, perhaps you can answer the question... why do cats do that? "Cats don't bark and act brave when they see something small in fur or feathers, they kill it." Cats, as we know, are hunters. Perhaps more than any other animal on earth, the cat is built to hunt and catch prey. They walk stealthily on their toes rather than on the flats of their feet. They're quick and agile, yet also very powerful for their size. Their claws and teeth are meant for tearing into flesh, and their rough tongues literally rip meat from the bones of their kills. Along with this physical prowess, comes the instinct to hunt. Play fighting and the game of tag that house cats often play with each other is simply practice for the real thing. One cat chases the other, and then they reverse roles and the hunter becomes the hunted. Satisfy your cat's need to act out this behavior by providing plenty of toys and encouraging play. If your cat enjoys the company of other cats, consider a companion cat as a house mate (but always do slow introductions to ensure household harmony). Most cats love to play with dangling things and show off their hunting behaviors (grabbing at prey). Fishing pole type toys work well to satisfy this need. 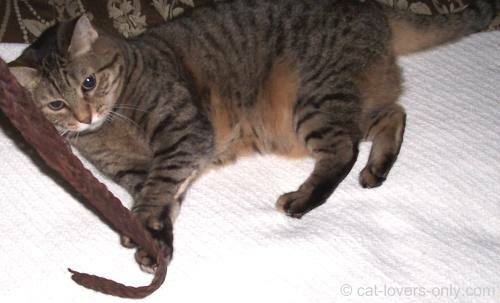 Priscilla (shown above) enjoys playing with the belt. She also likes to chase the belt around the house while it's dragged on the floor like a snake. It makes a good cat toy. This is just one of a number of homemade cat toys that she likes. Cats are extremely territorial. Not unlike people, cats establish territories in order to have a safe place to eat, sleep, play, and procreate. Many cats will patrol the house they live in as a way to check on their territory. They also will periodically rub their bodies, especially their cheeks, heads, and tails on everything, including the people in the house. This is their way of identifying objects, and claiming ownership of everything in the house, including the people. Your cat probably likes to be up high as most cats do. This helps to safely survey the territory, and spot prey and intruders. Even indoor cats are said to extend their territory out to areas they can see. A window lookout is a great spot to view the extended territory of the yard, or even the neighbor's yard. Make sure your cat has a nice window spot, and if possible, places to climb on so this satisfies the need to be up high. This will reduce tension and make your cat feel more secure. Cats develop a hierarchy and, to some degree, base their territories on it. Tom cats will fight for dominance over territory as they often do not tolerate any competition. Dominant toms will often have the largest territory in a given area. Lesser toms will usually have smaller areas, and queens with kittens will have a very small area that they will fiercely defend against aggressors. Mother cats may move their kittens often from one secluded place to another in order to avoid detection. In addition to having their own territory, outdoor cats may agree to time share certain areas. Pathways may be communal to a number of cats. Although cats and dogs may learn to get along, areas with dogs will often be avoided. In multi-cat households, indoor cats will also develop a hierarchy. When cats have been properly introduced, all cats in the house may agree to share the territory. Each cat may have favorite areas, including rooms, parts of rooms, or even parts of chairs or sofas. 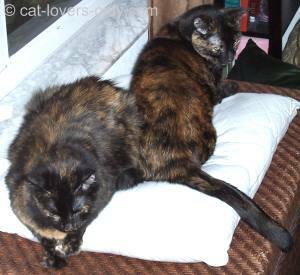 With cats that get along well, these areas may be time-shared as well. If you watch long enough, you'll see them trading places. That's not to say that there aren't disagreements, but fights are rarely full-on and usually only last a few seconds. "OK, I'll share... but scoot over will ya?" In some cases, each cat may claim a room or area and defend it, showing displeasure when another cat approaches. Anxiety may run high in these cases, and anti-anxiety and feline behavior modification methods may be necessary. Sometimes this is due to cats being introduced to each other too quickly, and a separation and reintroduction process may be necessary. In more serious cases, or where one or more cats have emotional problems, medication may be used. When indicated, veterinarians have been known to prescribe certain anti-anxiety medications for those more severe cases. Some of these medicines are not actually pet medications but are drugs made for humans administered to cats. There are new medications of this type being developed for companion animals, both dogs and cats. For those opposed to medication, Feliway (see below) may be a better solution to try first. If it works to ease the anxiety and tension, then behavior modification techniques could be used and no medication would be necessary. Territorial marking is an important part of a cat's life. Cats identify others largely by scent. Marking an area with a scent is a cat's way of saying "this is mine" and "I was here." Other cats can determine a lot by sniffing an area that was visited by others. You may notice that your cat will sniff your shoes, your pant legs, your purse, and your jacket to see where you've been and who might have been there with you. You may also notice your cat rubbing her body, especially her cheeks and head on everything from a corner of the wall, to you. This is one method of marking or scenting. These marks make your cat feel secure in her surroundings. In order to reduce anxiety in house cats with behavioral problems, veterinarians often recommend Feliway. Feliway Spray is a synthetic version of the cat cheek pheromone that you can spray around your house or on your clothes to make your cat feel more secure. Urine marking, or spraying, is another method of staking a claim, and is more extreme. Indoor cats may do this if threatened by another animal or situation, even if that animal is outside the house. Sometimes, animals will defecate to mark territory as well. In multi-cat households, there is sometimes one cat who does not bury the feces in the litter box. Instead, this "top cat" leaves the feces on top as if to state her superiority over the others. One of my cats, Teddie, has been known to do this on occasion, sometimes only partially covering it up. Spraying or defecating for territorial reasons is a distinctly different behavior from inappropriate elimination, which we term litter box problems or house soiling problems. If a cat is urinating or defecating outside the litter box, you have to make the determination as to whether it's territory related, or a true litter box problem. As a first step in dealing with inappropriate elimination, you'll need to have your veterinarian rule out any underlying medical conditions which may be causing these behaviors. Many factors can be at work here, including emotional problems and feline constipation. In this article, I cover more cat behaviors such as eating, communication, and self-grooming.